If you are looking at a Natal Chart that I wrote for you, the SEXTILE LINES in the middle of your Chart Wheel will be the color BLUE. Check your Natal Chart for Sextiles! 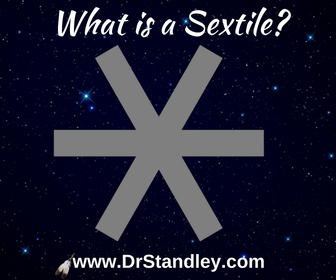 A sextile is an aspect that reveals cooperation and opportunity between 2 planets. Now we all know, where there is cooperation, it makes things easier and ease opens the door for "opportunity" to come in. A sextile is a 60Â° angle (8Â° "orb" or less) between two planets. Naturally more than two planets may be involved due to conjunctions that are listed above. Remember, conjunctions are planets that sit side by side. And if you have two planets that are side by side that make a 60Â° angle to another planet, then that creates 2 sextiles, one from each "conjunct" planet to the third (sextile) planet. Sextiles are considered a "soft" or "easy" aspects that reflect the planets involved. They have a way of delivering you an opportunity. It's as if the phone is ringing or there is a knock at the door. Again, it is your choice to answer the opportunity. Opportunities can reveal themselves under the strangest of circumstances. Even though they are "soft" and "easy" aspects, you still have to do the work. For instance, you may desire to be in a healing or teaching profession, but you still have to obtain the education and license necessary in order to manifest the profession. So you can sit and dream about it, moan about it, or complain about it OR you can do the necessary work to make it happen. You reap what you sow! If you do the necessary work to manifest your dreams and desires, then you'll reap the benefits of your discipline, dedication and committment. It's just that much sweeter! Sextiles are much like an apprentice, journeyman, student or trainee. This innate talent that you have; the natural "gifts" and "skills" you've been given are churning and being perfected. This is raw talent baby!!! Now, over time you may have to work and cultivate this talent until it's just ripe for picking. Then "BOOM," unleash it and the harvest will be there. The easiest way to remember when a sextile takes places is when one Sun Sign is separated by another Sun Sign by only one Sun Sign (on either side of it). So that means every other Sun Sign is sextile to the other. In other words, there is one Sun Sign between two Sun Signs. Aries is sextile to Aquarius and Gemini (both air signs) feeding Aries the fire sign. On one side of Aries, Pisces is the Sun Sign between Aries and Aquarius. On the other side of Aries, Taurus is the Sun Sign between Aries and Gemini. Taurus is sextile to Pisces and Cancer (both water signs) feeding Taurus the earth sign. One one side of Taurus, Aries is the Sun Sign between Taurus and Pisces. On the other side of Taurus, Gemini is the Sun Sign between Taurus and Cancer. Gemini is sextile to Aries and Leo (both fire signs) feeding off Gemini the air sign. One one side of Gemini, Taurus is the Sun Sign between Gemini and Aries. On the other side of Gemini, Cancer is the Sun Sign between Gemini and Leo. Cancer is sextile to Taurus and Virgo (both earth signs) feeding off Cancer the water sign. One one side of Cancer, Gemini is the Sun Sign between Cancer and Taurus. On the other side of Cancer, Leo is the Sun Sign between Cancer and Virgo. Leo is sextile to Gemini and Libra (both air signs) feeding Leo the fire sign. One one side of Leo, Cancer is the Sun Sign between Leo and Gemini. On the other side of Leo, Virgo is the Sun Sign between Leo and Libra. Virgo is sextile to Cancer and Scorpio (both water signs) feeding Virgo the earth sign. One one side of Virgo, Leo is the Sun Sign between Virgo and Cancer. On the other side of Virgo, Libra is the Sun Sign between Virgo and Scorpio. Libra is sextile to Leo and Sagittarius (both fire signs) feeding off Libra the air sign. One one side of Libra, Virgo is the Sun Sign between Libra and Leo. On the other side of Libra, Scorpio is the Sun Sign between Libra and Sagittarius. Scorpio is sextile to Virgo and Capricorn (both earth signs) feeding off Scorpio the water sign. One one side of Scorpio, Libra is the Sun Sign between Scorpio and Virgo. On the other side of Scorpio, Sagittarius is the Sun Sign between Scorpio and Capricorn. Sagittarius is sextile to Libra and Aquarius (both air signs) feeding Sagittarius the fire sign. One one side of Sagittarius, Scorpio is the Sun Sign between Sagittarius and Libra. On the other side of Sagittarius, Capricorn is the Sun Sign between Sagittarius and Aquarius. Capricorn is sextile to Scorpio and Pisces (both water signs) feeding Capricorn the earth sign. One one side of Capricorn, Sagittarius is the Sun Sign between Capricorn and Scorpio. On the other side of Capricorn, Aquarius is the Sun Sign between Capricorn and Pisces. Aquarius is sextile to Sagittarius and Aries (both fire signs) feeding off Aquarius the air sign. One one side of Aquarius, Capricorn is the Sun Sign between Aquarius and Sagittarius. On the other side of Aquarius, Pisces is the Sun Sign between Aquarius and Aries. Pisces is sextile to Capricorn and Taurus (both earth signs) feeding off Pisces the water sign.. One one side of Pisces, Aquarius is the Sun Sign between Pisces and Capricorn. On the other side of Pisces, Aries is the Sun Sign between Pisces and Taurus. Look at the nature of the planets involved, then work that Sextile!